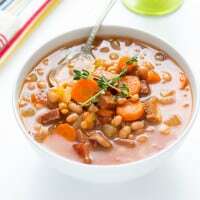 This slow cooker navy bean soup with ham is like a cozy sweater on a cold day. It’s full of hearty veggies, creamy beans, fresh herbs, and salty ham. You’re going to love this slow cooker navy bean soup with ham. I realize that I’m coming off a bit strong and confident, but what’s not to love about beans, veggies, and ham? I battled the elements (snow, sleet, and ice) for fresh herbs. Okay, that’s a lie. I had a package each of fresh rosemary and thyme wilting in the fridge, so I gave them a rough chop and threw them in the pot with the other ingredients. I was hoping to come across as heroic, but that would a lie. Instead, I bundled myself up in fleece-lined leggings, a double layer of wool socks, and my warmest hoodie while I watched my husband shovel the snow from the warmth of my big, cushy chair. I tried mustering up a little compassion, but then I remembered washing and folding 10 loads of laundry and the feeling quickly vanished. While I didn’t trek 10 miles in 2 feet of snow with just a hope and a prayer for herbs, I did open my refrigerator door. Whew! Life is rough, you guys. The fresh bits of rosemary and thyme are like little bursts of flavorful buoys floating in a sea of brine-y, ham-scented broth. If that doesn’t get your motor rumblin’, I don’t know what will. The best part about this soup is that it involves very little effort. Soak the beans and chop the veggies. After you have completed that small task, throw everything into the bowl of your slow cooker and go about your business. Ten hours later, you’ll return to a crock full of hearty soup that smells heavenly. I like to serve this soup with a big chunk of crusty bread smeared with a generous amount of salty butter. 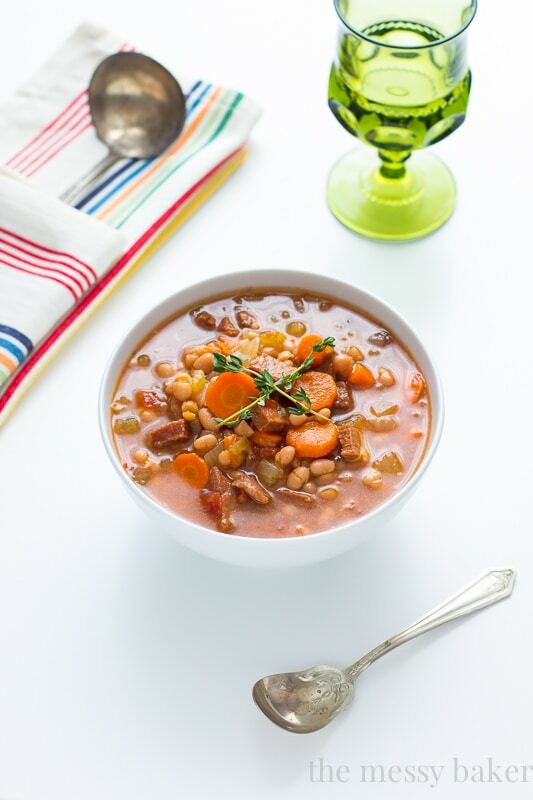 This soup is full of hearty veggies, creamy beans, fresh herbs, and salty ham. Add the navy beans to a large bowl. Cover with water and allow them to soak overnight. Drain the beans and add them to the bowl of your slow cooker. Add the remaining ingredients to the slow cooker with the beans. Stir to combine. Cook on low for 10 hours. Season with salt and pepper to taste. Serve with crusty bread. I just love the combo of beans and ham. What a great soup! Beans and ham are a match made in Heaven! This soup looks amazing. I love the color! I have a meaty ham bone in the freezer waiting for this soup! And it’s perfect comfort food for this snowy day! What a great soup and a fabulous way to use leftover ham. Mmm… looks so cozy and warming! And love the ham addition! Huge fan of Navy Beand!! This looks fantastic! Very classicly done flavor combos! Great job! Reminds me of my childhood! Comforting Navy Bean Soup! Looks yummy! I love hearty soups like this one! I can deal with the snow and cold if I can have this for dinner! Pinned! LOL gotta love some good old fashioned give-and-take – I’d totally trade doing laundry for shoveling snow. LOVE this slow cooker veggie + ham soup! There really is nothing better on a cold winters day! You had me at slow cooker! Seriously, this recipe sounds delicious … and I love that it will be ready and waiting for me when I get home! This is gorgeous bowl of soup and I sure would love it with this nasty cold I have!! Lovely use of beans!! This is one of those classic combinations that I’ll never get tired of. Looks delicious! You can’t go wrong with a hearty bean soup like this! Ham and bean is one of my favorite combos for soup. Yum! Ham and bean is one of my favorite soups and yours sounds wonderful! I put this together in my crock-pot this morning & I’m a little worried; there didn’t seem to be enough broth. I followed the recipe, except I only used 1 lb of ham, and I only had enough broth to cover everything. Is this right? Hi Ashley! I apologize for the delayed response. I don’t know why, but I’m just now seeing your comment. It may not seem like enough broth, but as the soup cooks, the veggies and ham will release the remaining liquid the soup requires. I hope you liked the soup! This soup was a good base but was extremely bland. Needs significantly more seasoning! Hi Mary! I’m so sorry you thought the soup was bland. The only seasonings I added at the end were salt and pepper to taste. Other than that, the ham and fresh herbs really flavor the soup nicely, in my opinion. I soaked my beans overnight and they have now been cooking near 10 hours. They are still a little hard and there is no way this will be ready in an hour for dinner. I even cooked it for several hours on high…. Hi Tori and Terri. I’m so sorry to hear that you guys are having this issue. Did you soak your beans overnight prior to adding them to the slow cooker? Hi ladies! I decided to make this soup today since Mother Nature will be dumping almost 2 feet of snow on us here in Baltimore this weekend. I checked my beans at the 7-hour mark and they were tender. How long did you ladies soak your beans? Mine soaked for about 10 hours.